I remember when I took my first improv class it quickly dawned on me that my improv teacher was teaching me a lot of the same concepts and skills that I was using to attempt to enlighten my clients with in therapy. The parallels between improv and therapy are incredible and the therapeutic benefits that are naturally embedded within the learning and performance process of improv are astounding. Fast forward to a few years later and I am now teaching ground-breaking improv classes to people with various unique needs with Stomping Ground Comedy’s Improv for Life program. Our Improv 101 class at the NonPareil Institute (a school for adults with autism) ended in December 2017 and I am eager to find more students to work with after seeing the growth of our students. I witnessed our students gain an unbelievable amount of social skills and confidence in a short 7-week course. For anyone reading who is not familiar with improvisational comedy, it is a spontaneous type of live theater where plots, characters, and dialogue are all created in the moment usually prompted by a one word suggestion. Improv is completely unscripted. Improvisers are trained to learn the ins and outs of improv comedy in a group by learning a set of guidelines. These improv guidelines are used to help performers create dialogue and to help the scene flow. When things are flowing, improv is highly enjoyable to watch. So how does improv help people with autism? I think it’s important to understand the needs of the population first to truly understand the benefits. Autism presents itself in individuals who are neurologically and genetically distinct from the average person. No two people with autism will demonstrate the exact same behavior pattern. Each is unique. But for the purposes of gaining perspective, I would like you to step into the world of a person with some common autism symptoms. Imagine for a moment that you do not have the intuitive and subconscious ability to read others- something that many of us take for granted. Picking up on non-verbal cues such as facial expressions, body language, and eye contact are not skills you come by naturally. In the same way that you are challenged to understand and interpret others, you are also challenged to express and communicate your needs, desires, and interests. It might be difficult to be emotionally and socially responsive, making it seem like you are aloof or distant. You may also find it hard to initiate and sustain conversations. You could even have atypical communication skills like repeating phrases, delayed language development, or not being able to speak at all. All of this is likely to cause your social interactions to be a challenge and you may have difficulty forming and maintaining relationships. Just think about how often you have social interactions and the role they play in your life. What if you couldn’t express yourself or read others? Research is showing us that people with autism who are higher functioning are able to learn social skills, helping them to make connections and have a better quality of life. What a wonderful finding, right?! So, how do you teach social skills to someone? Well, improv is a great way, which would explain why psychology programs at universities are currently researching and implementing improv for people with autism. It is through the learning of improv guidelines where self-growth, empowerment, and shifts in behavior and thinking naturally happen. Stomping Ground Comedy’s Improv for Autism class was carefully designed to tune social skills and connection for people with autism. When we began our first Improv 101 class at NonPareil Institute in October, we set the stage that class was a “no-judgement zone”. Creating an environment that is accepting, safe, and fun while in a group setting is gold. It’s gold for anyone, but especially for someone with autism. Our students loved this, as they were able to freely be themselves and express themselves in whatever ways came to them in the moment. A group setting IS a social setting, which means social interactions are happening at every moment during class. Group cohesiveness is naturally occurring and connections are forming without being forced. We had our students create the ground rules for the next seven weeks. Each student was given the opportunity to set a boundary on a topic, issue, or behavior that they did not feel comfortable with in a scene or in class. Through this, students not only learned how to communicate setting social boundaries (something that can be extremely challenging for all of us); they also learned how to respect the boundaries of their peers. (Yes, I know what you’re thinking- EVERYONE should take an improv class! We think so too). Class boundaries were discussed and brought up throughout the course, and students could always add a boundary in any class as issues arose. This is a valuable social skill to practice- communicating and respecting boundaries in a healthy way throughout the course of any relationship is essential. The number one guideline when doing improv comedy is to say â€œYes, andâ€ in a scene or game; With this guideline, you ACCEPT that your scene partner has created and you ADD to that made-up reality. Our students were so good at this and they had so much fun doing it. They were expressing themselves in whatever way they wanted, with no correction and no judgement. This was such a confidence builder. When people are agreeing with you AND adding information to a world you just created, it feels pretty darn good. Our â€œyes, andâ€ scene work not only boosted confidence but it also cultivated a sense of capability in initiating conversations and having conversations. Students were practicing how to have conversations by listening and responding, giving and taking, and committing to the scene they were in. By our last class, we could all feel that friendships had flourished. When you put a group of people in the same room that all have a commonality, you will inevitably find that a bond is created. Most of our students told us on the first day of class that initiating conversations with others and even entering into a group setting was very hard for them. Many said they took the class because they didn’t have many or any friends at nonPareil and it was difficult for them to meet people. The difference was night and day when our last class arrived. They were all laughing and snickering to one another about inside jokes like a group of fraternity brothers. Our students put on a show for their friends and family last week. I have to admit, I was a little jealous of how many laughs they got. They put on a hilarious show. Mostly, I was proud and amazed. Each and every student did an incredible job performing the skills they had learned over the course of seven weeks. These skills were essentially social skills that they practiced and practiced and eventually performed. The biggest takeaway was that I saw these students form relationships and use these skills in real life. The staff saw the students’ growth and the students saw it in themselves. There is a whole other dimension of improv that we have traveled to now, and we are here to stay and explore so we can bring improv for unique needs to our great city of Dallas. I look forward to connecting with the community and finding where programs like this are needed most. 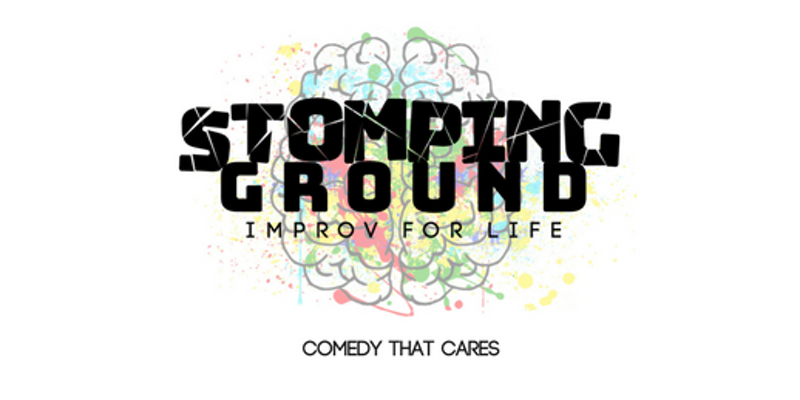 To read more about the autism class offered for adults and teens at Stomping Ground and further reading about why improv is beneficial to many unique populations, visit our Improv for Life page.